Image 1: The context menu displayed when an image is right-clicked, includes Edit In…, add to a quick collection, create a virtual copy, and others. The available commands are all actions that can be taken on the image. This reduces the need to hunt for the correct command in the main menus. Image 2: The context menu for a folder in the Folders panel of the Library module. Context menus are great for speeding up your workflow. Right-click on an image and you are presented with a list of pertinent commands that can be performed on the image. To invoke an action in the context menu, simply click on it. For example, right-click a folder name inside the Folders panel and you can create a folder inside the folder, rename the folder, remove the folder, save metadata, synchronize a folder, update a folder location, Import to the folder, export the folder as a catalog, show in finder, or get help. See image 2. This much simpler than searching eight menus for the right commend. If you are on a PC, right-clicking an object is easy. Just position the cursor over the object and click the right button on your mouse or the right key on your trackpad. If you are on a Mac, it is a little more difficult. First, get rid of Apple’s Magic Mouse; it is hard to use and even harder to right-click with it. Instead, buy and install a two button Bluetooth mouse on your computer. Now, to right-click, simply click the right button. If you have a separate trackpad for your desktop or are using a Mac laptop with its trackpad, click the trackpad with one finger for a left-click and two fingers for a right-click. 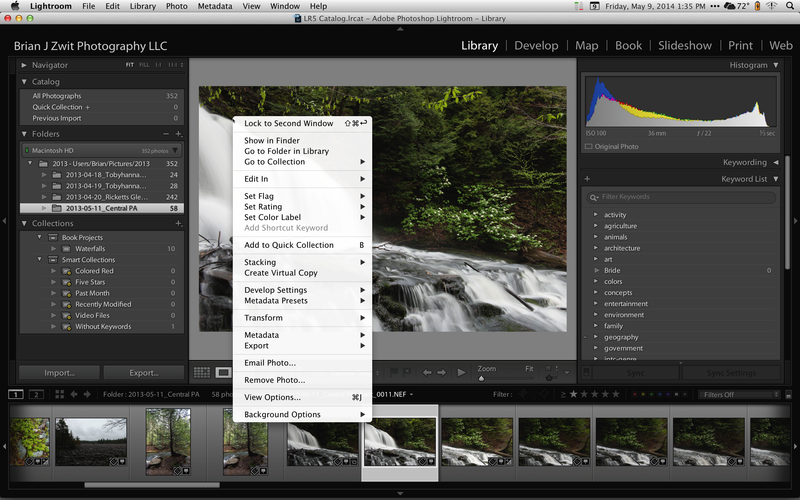 Using the context menus in Lightroom is easy and will speed up your workflow. The commands in a context menu are available in the main menu but so are other commands that are not relevant to your current needs. Editor’s Note: In early May, Brian started a series of ten posts each outlining one or more simple but small things you can do to speed up your Lightroom workflow. This is the second post in that series; the first post was about how to efficiently manipulate Lightroom’s interface to reduce clutter. 09 May	This entry was written by School of Creative Photography and published on May 9, 2014 at 3:37 pm. 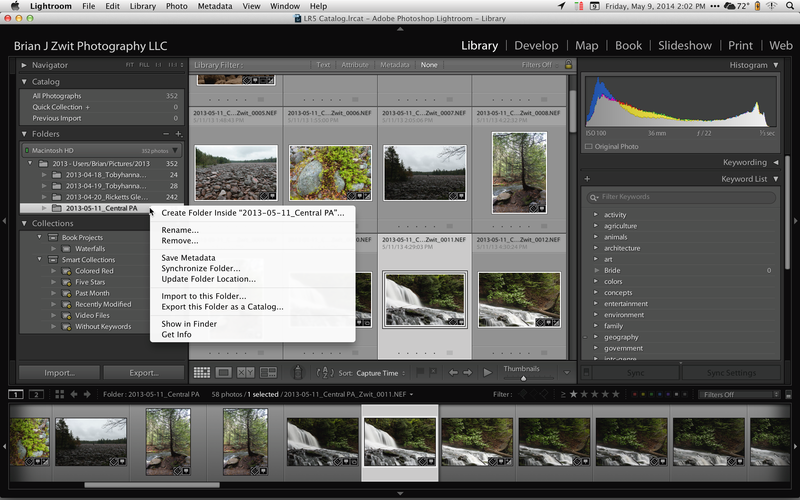 It’s filed under Editing Images and tagged editing, lightroom, raw, workflow. Bookmark the permalink. Follow any comments here with the RSS feed for this post.